Are you interested in making your own ejuice but aren’t sure where to get your supplies? We’ve got you covered – and right here, you’ll find a wide selection of vape juice bottles for sale, each one made from recyclable high-density polyethylene plastic. This means the plastic is food-grade and safe to store your e-juice in. Using only HDPE plastic bottles minimizes the risk of any plastic leaching into your juice mixture, even if they're stored for long periods of time. The result? Better tasting safer e-liquid for all! Using plastic liquid containers for DIY e-liquid is the most cost-effective way to mix and store your ejuice. Our bottles will also have the option to change out the regular RIB caps for dropper tips to make it easier to refill your tank. The Yorker tip dropper caps we carry here come with a seal, so you can carry your refill bottles with you wherever you go without worrying about the dropper leaking or making a mess while you're out. 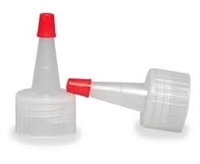 Dropper caps are much more convenient than using a syringe or pouring straight from the bottle, so make sure you have a few spares that fit the bottles you use most often. Look no further for where to buy e-liquid bottles – we’ve got the best options at great low prices, so place your order today!